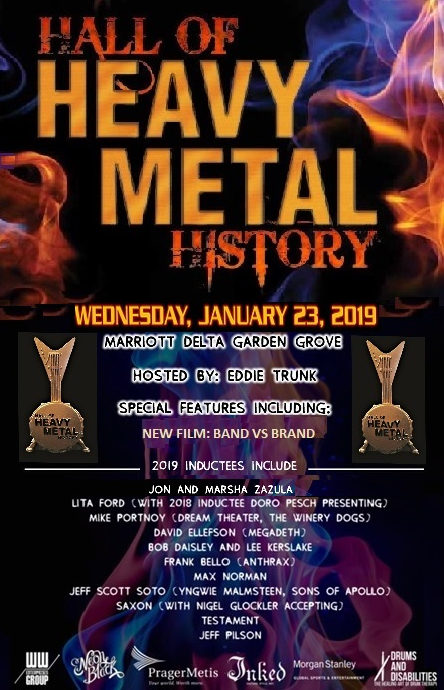 The annual Hall of Heavy Metal History's Metal Hall of Fame Gala will take place on Wednesday, January 23, 2019 at Marriott Delta Garden Grove in Anaheim, CA. The event will be hosted by iconic television, radio personality and heavy metal champion Eddie Trunk, and will feature appearances by heavy metal greats of today and years past. The Metal Hall of Fame Gala is quickly solidifying itself as the most important night in rock and metal! The event will feature performances by legendary drummers and Hall of Heavy Metal History inductees Carmine Appice and Vinny Appice, as well as a performance by hard rock/punk icon Jean Beauvoir. Los Angeles heavy rock/metal group Budderside will open the show. The event will also feature the premiere/free screening of Cleopatra Entertainment's new film Band vs. Brand before the gala begins. Several celebrities from the film will be present at the screening. Please note event times have changed: Doors open at 4:30 PM, and a red carpet will take place from 5:00-7:00 PM. The free screening of Band vs. Brand will take place from 7:00-8:00 PM, and the gala/induction ceremony will begin at 8:00 PM with Budderside's performance. Admission is open to the public - tickets are available for just $30 via www.thehallofheavymetalhistory.org. More surprise guest appearances are scheduled to be announced! Pat Gesualdo, Hall of Heavy Metal History Founder/CEO, says, "We are looking forward to another amazing year at the 2019 Metal Hall of Fame Gala, and following up on last summer's amazing live induction of Judas Priest and "The Metal Queen" Doro Pesch in conjunction with our festival partners Wacken Open Air. As with last year, several iconic bands, industry executives and artists will be inducted in 2019. We are grateful for all the hard work they've done over the years to keep rock and metal relevant. I also want to take this opportunity to praise metal fans all over the world. They are an important part of the Hall of Heavy Metal History. With their support, they are helping us keep rock and metal alive for generations to come." 2019 inductee Bob Daisley adds, "I'm very pleased and feel honored to be inducted into the Hall of Heavy Metal History after all these years. I'm pleased for Lee Kerslake too. He's been a major player in the genre. Thank you to John Sykes for accepting our awards, I'm grateful and honored to have you do it." 2019 Hall of Heavy Metal History inductee Mike Portnoy says, "It is my honor to be inducted into the Hall of Heavy Metal History this year! It's also exciting to share this honor with a few of my band mates like David Ellefson (Metal Allegiance) and Jeff Scott Soto (Sons of Apollo). I look forward to attending the celebration!" "We are honored to be recognized by the Hall of Heavy Metal History. It has been a privilege to provide you with the soundtrack of your lives. We look forward to seeing you all at this momentous occasion," add Megaforce Records founders Jon and Marsha Zazula. Rob Halford of Judas Priest, who was inducted this past summer at the 2018 Wacken Open Air festival, says, "Judas Priest are thrilled and honored to accept induction into the Hall of Heavy Metal History and be amongst so many of our friends. This also sends a great message of inclusion for the metal community around the world, and keeps us defending the metal faith together." Inductees awarded in previous years include Ronnie James Dio, Randy Rhoads, Lemmy Kilmister, Scorpions, Bill Ward, Billy Sheehan, Jordan Rudess, Nick Menza, Munsey Ricci, Exodus, and many more. The Hall of Heavy Metal History is a non-profit organization dedicated to forever enshrining the iconic musicians and music industry executives responsible for making rock and metal music what it is today. Their contribution to the genre is invaluable, and they continue to inspire fans throughout the world, from generation to generation. The Hall of Heavy Metal History hosts the annual Metal Hall of Fame Awards Gala, in addition to an on-stage induction ceremony at Wacken, Additionally, the Hall of Heavy Metal History is part of the D.A.D. Program to help children fight disabilities on a global basis, and is partnered with the Ronnie James Dio Stand Up and Shout Cancer Fund. For more information, please contact: info@thehallofheavymetalhistory.org or 973-725-5150.